The electric car market in China appears to now finally be picking up some steam, based on some of the most recent numbers from the country. And not “picking up some steam” in a minor kind of way, but in a significant enough way to put it on par with the world’s largest electric car markets — for example, in September, the numbers in China were high enough to make direct comparisons with the US market, which is the largest electric car market in the world. Something to note, though — these new numbers aren’t exactly official, but they are currently the “best” that we have. Coming to us via Jose Pontes of EV-Sales.blogspot.com, the figures were obtained via some unofficial channels. He notes that Kandi EV sales are surely a bit off, as the number he has in there is the number of Kandi EVs produced (not registered). Also, the Chery QQ3 EV and Tesla Model S numbers are estimates. 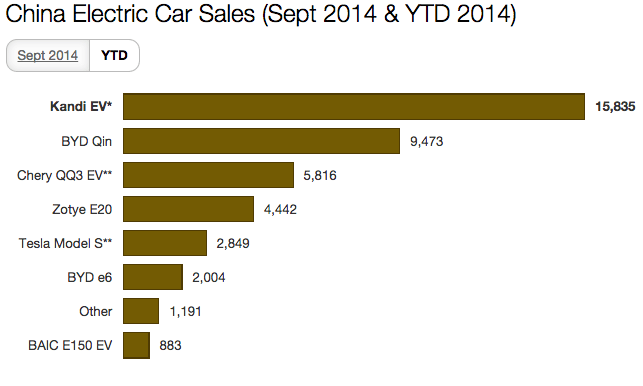 Nonetheless, these numbers probably aren’t too far off, and they show great EV sales growth. Furthermore, this is without the numbers for the new BYD & Daimler Denza and the Dongfeng Nissan Venucia e30. Based on Jose’s numbers, the Kandi EV accounted for 56% of the market in September (37% for the year to date), the BYD Qin account for 14% (22% YTD), the Chery QQ3 EV accounted for 6% (14% YTD), the Zotye e20 accounted for 14% (10% YTD), the Tesla Model S accounted for 4% (7% YTD), the BYD e6 accounted for 2% (5% YTD), the BAIC E150 EV accounted for 2% (2% YTD), and other EV models accounted for 2% (3% YTD). Altogether, the sales numbers in China are certainly good, but obviously they are also still a relatively insignificant portion of the total automobile market in China, despite quadrupling in the last year. 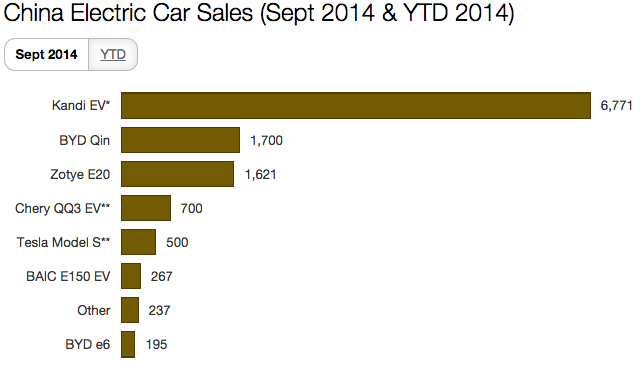 The EV share of the country’s overall auto market this September was 0.33%, as compared to just 0.08% last September. So, significant growth for sure. But still not enough to make much of a dent in any real way yet (in terms of carbon emissions, pollution, etc).